If I could host anybody from the Bible at a dinner party, whom would I invite? Someone asked me that the other day, and I have to admit I’d not really thought about it before. But it’s a great question because there’s such a wide range of characters to choose from. Who would make my A-list, and who would be discreetly omitted? It’s actually more fun to consider those whom I wouldn’t invite. For sure Cain wouldn’t get an invitation, nor would Samson. They’d be too rowdy. Nor would most of the prophets, simply because so many of them were difficult to live with. And it’s nothing personal, but I’d turn Herod away at the door simply because his presence could make the other guests just a little nervous. My A-list would be surprisingly long. David and Solomon would make it, most definitely. Neither was perfect, but as kings they knew how to behave properly at dinners. 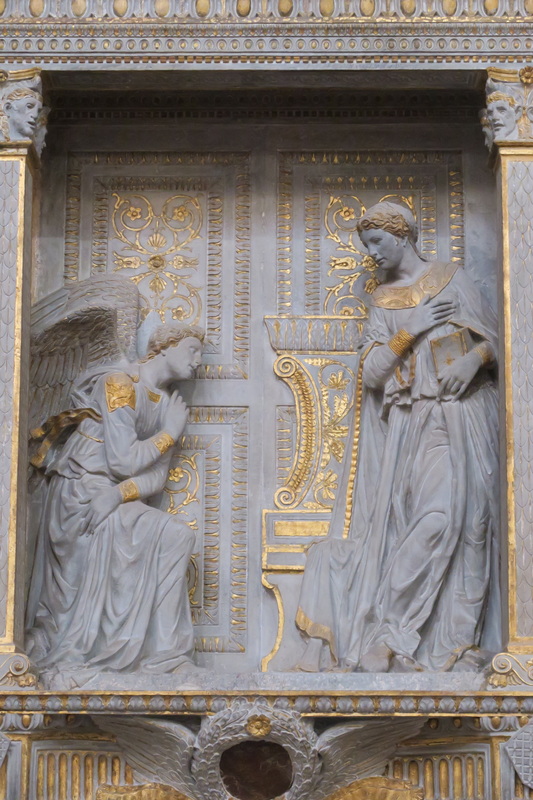 Rebecca would be there for her cleverness and Mary Magdalene for the wonderful stories I hope she would tell. For his conversation Paul would be fascinating if not scintillating. And Jesus would be at the top of my list. He’d be there not because of favoritism on my part but based solely on his reputation. The gospels portray Jesus as accomplished on the banquet circuit, and they provide lots of evidence to back that up. At Cana, for instance, he helped out with the wine, which spared the hosts a lot of embarrassment. He was a gracious guest at the home of Zachaeus and an equally gracious host at the Last Supper. Clearly he had thought about the art of dining and conversation, as many of his parables suggest. Then there are a few individuals whom I would not have thought to invite, and John the Baptist is one of them. It’s not because he was a nobody, because today we honor his memory all over the place. My own monastery is dedicated to him, and the Order of Malta is actually the Order of Saint John of Jerusalem, of Rhodes and of Malta — to name but two from a myriad of examples. Still, I have to believe that John didn’t get a lot of dinner invitations. For one, the Bible makes no mention of any polished manners, and he seems to have had none of the savoir-faire of Jesus. He didn’t care much about food, as his diet of locust and honey suggests. Nor did he care much about fine clothes, because he was definitely not known as a snappy dresser. More to the point, John was the sort of person who readily said what was on his mind. It’s true that people went miles out of their way and into the desert to hear him, but it wasn’t because of any reputation for glamour. All of that makes him a rather intriguing figure, but I wonder if people weren’t willing to risk having him at a dinner party. On the second Sunday of Advent, John the Baptist steps onto the stage and into the story leading to the Nativity of Jesus. He’s intriguing, but for reasons that distinguish him from Jesus. He preached in the wilderness and not in synagogues or in Jerusalem. He didn’t carry himself like a rabbi, in contrast to Jesus. And while he too had disciples, he certainly didn’t run around with the smart set. Yet, like Jesus, he was a powerful preacher. Like Jesus he didn’t always tell people what they wanted to hear; but also like Jesus he was not afraid to tell people what they needed to hear. I sort of hate to admit it, but there’s real value in having someone like John the Baptist sit at our table. He might make us feel a bit uncomfortable, but without someone to call us out of ourselves, how would we ever become aware of the larger world? Without someone to awaken us to our potential for growth, how would we ever crawl out of our comfort zone and achieve the things we never thought possible? Without someone like John the Baptist, how would we ever own up to the mistakes we make? John, in short, is a mind-expander. He urges us to examine ourselves and be self-aware. He points to paths of which we are unaware, and he tells us that the Lord is waiting for us, just ahead. When all is said and done I suspect that each of us needs someone like John the Baptist. Such people help us to find our way through life. They remind us that the path to a full life is one that includes God. And if that sounds a bit difficult or inconvenient, consider the ultimate reward of a life well lived. I suppose then that it’s worth the risk to invite John the Baptist to sit at our table. He may not make our A list, but consider how wonderful it could be to host a guest who only wishes the best for us. +As we progress through Advent many of our monks assist with penance services at area parishes. On December 5th I assisted at the Church of Saint Martin, in Saint Martin, MN. 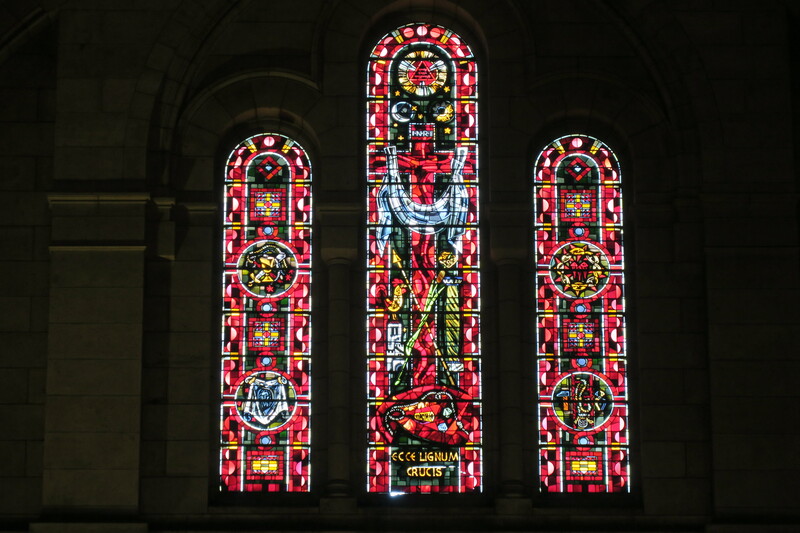 It’s a parish that the monks of Saint John’s have served since its foundation in 1858, and our confreres Frs. Edward and Julius serve there today. Located about twenty miles west of Saint John’s, it was the first time I had ever visited the small town of Saint Martin. +On December 6th I flew to Naples, FL, where I attended a meeting of supporters of our scholarship program that enrolls alumni of Immokalee High School at Saint John’s University. This spring we will graduate our first two students from Immokalee, and it’s been a wonderful experience. To say the least, their experience at Saint John’s has been transformative. 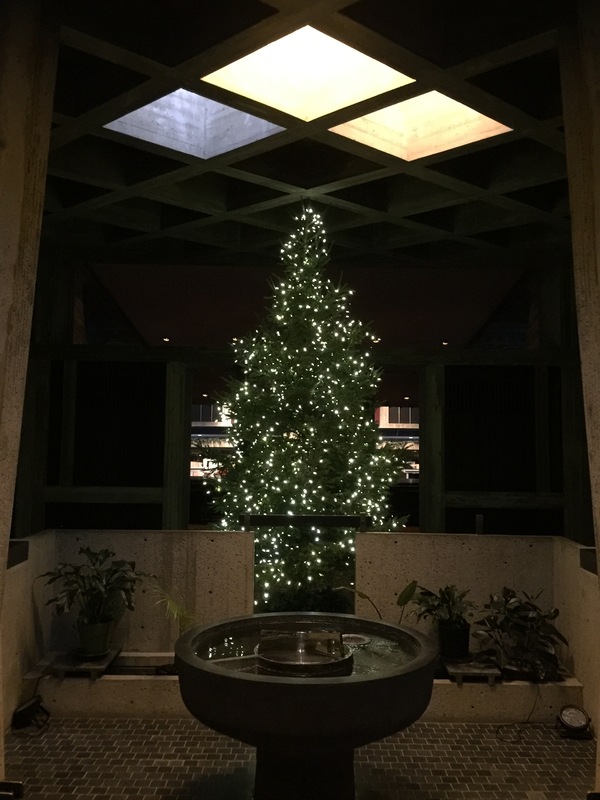 +On December 3rd we hosted the members of next year’s Benedictine Volunteer Corps at evening prayer. The 26 soon-to-graduate seniors of Saint John’s University comprise the largest group of Volunteers that we’ve ever sent out, and they will serve in thirteen monasteries in twelve countries and the Commonwealth of Puerto Rico. 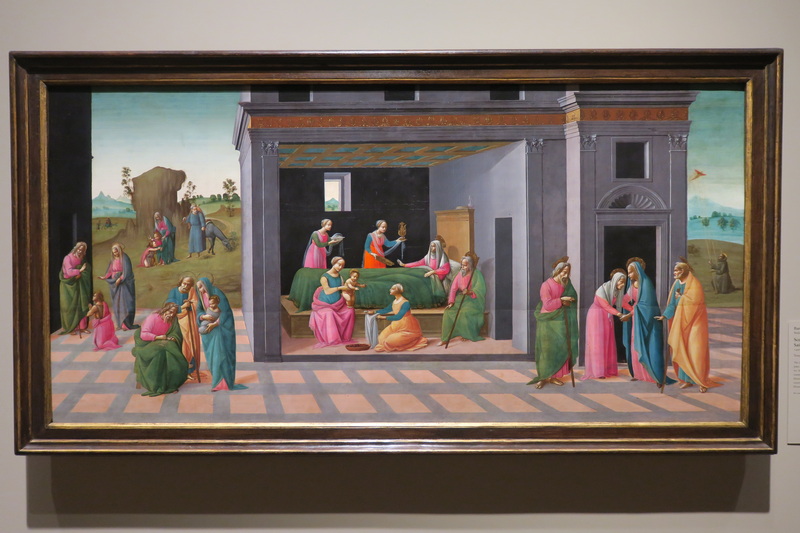 +The first three photos in today’s post are Scenes from the Life of Saint John the Baptist, a work of Bartolomeo di Giovanni, Italian, ca. 1465-1501. 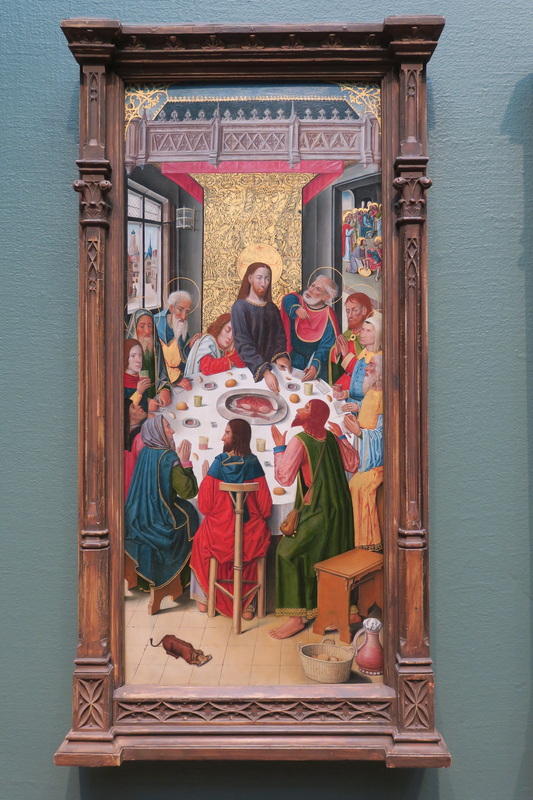 It is now housed in the Art Institute of Chicago, as are the following two photos showing John the Baptist and the Last Supper. 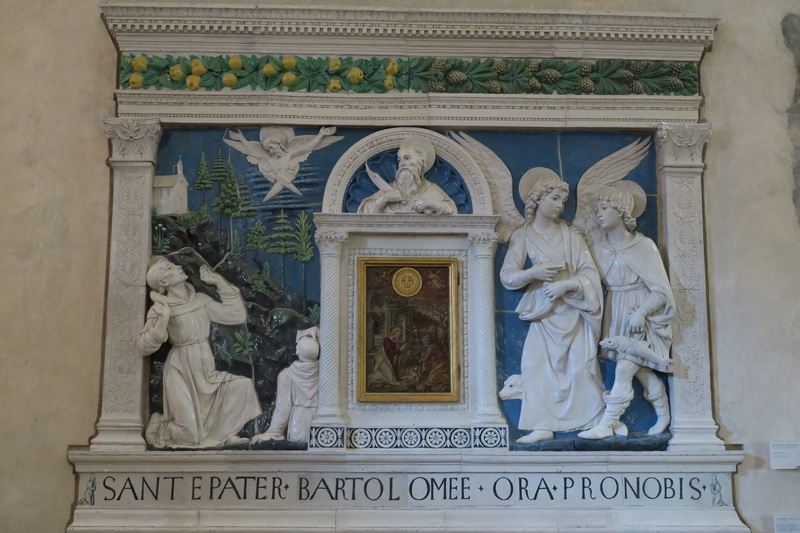 The latter were originally part of an altar panel, and date from ca. 1490, France. At bottom is the cohort of Benedictine Volunteers for next year. Our confrere Fr. Timothy supplied the photo. Matthew 18 is for me one of the more difficult gospel passages to digest. On the one hand Jesus asks his followers to forgive their neighbors seventy-seven times. Then in the next breath he tells the story of a slave whose sin seems unforgivable. That slave had begged for and received forgiveness of a debt owed to his master, only to turn around and treat a fellow slave mercilessly. For this act of meanness the first slave paid dearly, and it suggests that there may be limits to the “seventy-seven times” rule. Given that this was likely a case of hypocrisy, however, I can understand why Jesus might be moved to make such an exception. A couple of years ago I read an excerpt from columnist George Will that’s lodged in my mind ever since. He cited Robert Louis Stevenson to the effect that “Sooner or later we will all sit down to a big banquet of consequences.” Neither Will nor Stevenson were writing about religion, but the words apply, particularly so in light of the events in Pennsylvania during the past few days. In this more recent case the sins of some were compounded by the official hypocrisy of others. It was the latter who had demanded the highest of standards for others, but then in the next turn they expected people to give them the benefit of the doubt. If I’m not mistaken, this was a major theme in the preaching of Jesus. Regularly he hammered away at those scribes and Pharisees who placed heavy burdens on others while they crafted easy outs for themselves. Fortunately Jesus never said that the sin of hypocrisy was unforgivable, but serious amendment of life had to figure as a necesssary prerequisite. As surely as the sun appears in the morning, sins do come home to roost, and no one should be surprised at the ripple effects. In this most recent case sin has devastated the lives of those sinned against. But sin has also impacted those who were thought to be innocent bystanders. The crushing disappointment that they now experience should astonish no one, because it’s a byproduct of the social dimension of sin. Those who trusted that the Lord would walk with them always — in good times and in bad — now find themselves wandering alone in the valley of darkness. Or so it might seem. If there’s a lesson to be drawn, it may be this. Whether we have amateur or professional status as sinners, our lives do matter. What we choose to do or leave undone matters. All things matter, for good and for ill, and our lives have consequence. And so we can never let sin — in any of its forms — get the better of us. So it is that we should prepare ourselves to sit someday at the big banquet of consequences. And may we be so blessed to discover that we have been seated next to the Lord. +On August 16th I presided and preached at the abbey Mass. 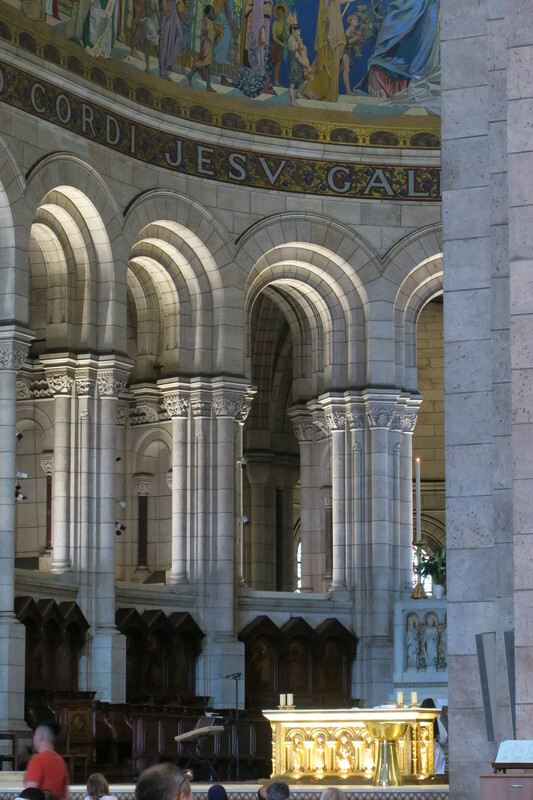 Today’s post is an expanded version of the sermon that I delivered that day. 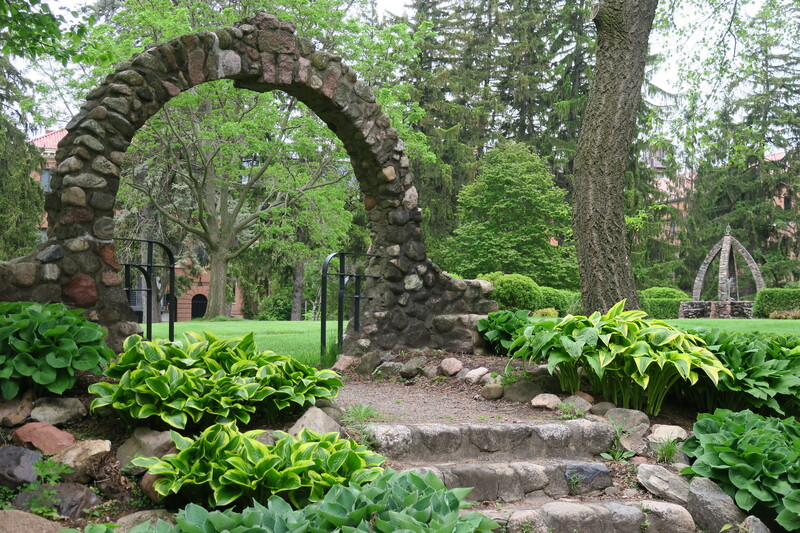 +On August 15th, the feast of the Assumption of Mary, the first of our students returned to campus for the fall term. This group mainly consisted of members and trainers of the football team. +On Sunday August 19th The Saint John’s Boys Choir provided music at the abbey Mass. They did a sterling job, all the more so because they had just completed their annual beginning-of-the-season choral camp. +On Sunday evening the students working as resident assistants in the University dormitories joined us for evening prayer. By the time every one else had been seated, some one hundred visitors had nearly filled the choir stalls. +Happily for me, I stayed home the entire week, and I had no complaints. Just comparing notes with some of my confreres allowed me to count my blessings. As University chaplain, Fr. Nick went with 120 freshmen and 30 upperclassmen on a several-day orientation trip to the Boundary Waters Canoe Area in northern Minnesota. The thought of overnights in the wilderness sends shivers up my spine. Meanwhile, Fr. Lew flew to East Africa to visit several of our Benedictine Volunteers. And in the last hint of the change of seasons, Br. Lucian returned to Notre Dame for his second year of doctoral studies, following a nice stint at home with us. 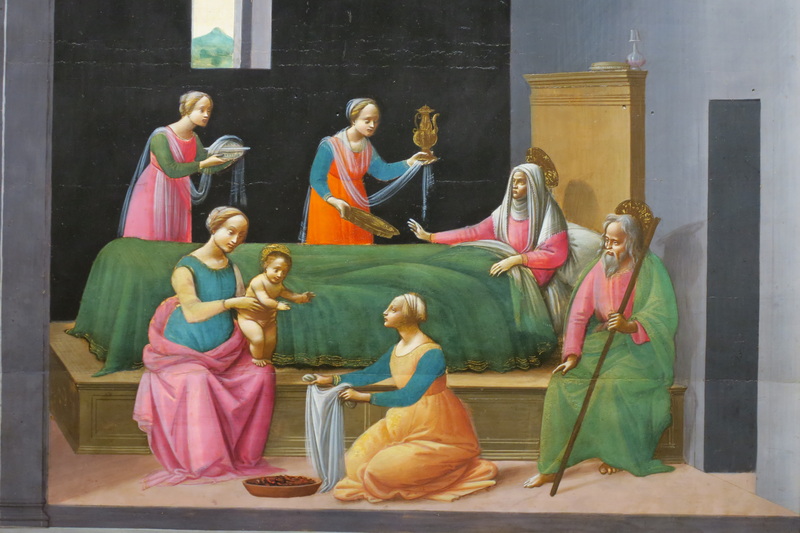 +In today’s post I’ve selected work from the church of Santa Croce in Florence. 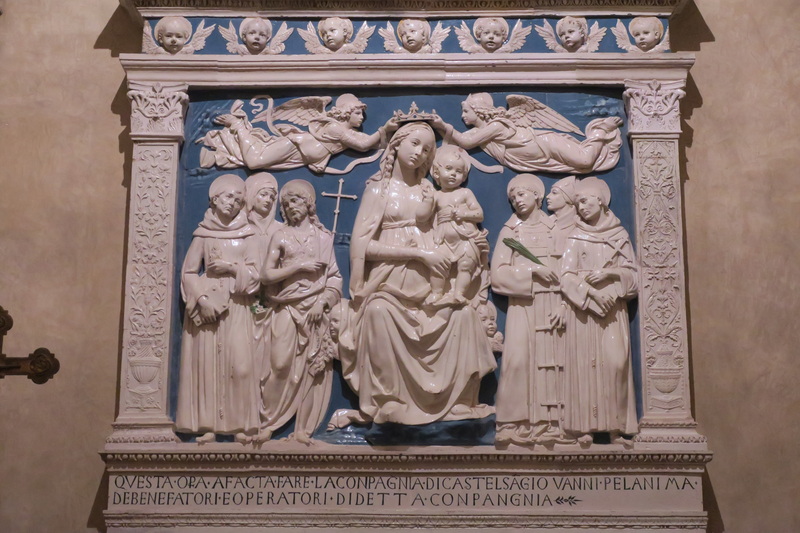 At top and bottom are terracotta altarpieces by Andrea Della Robbia, both dating from the end of the 15th century. 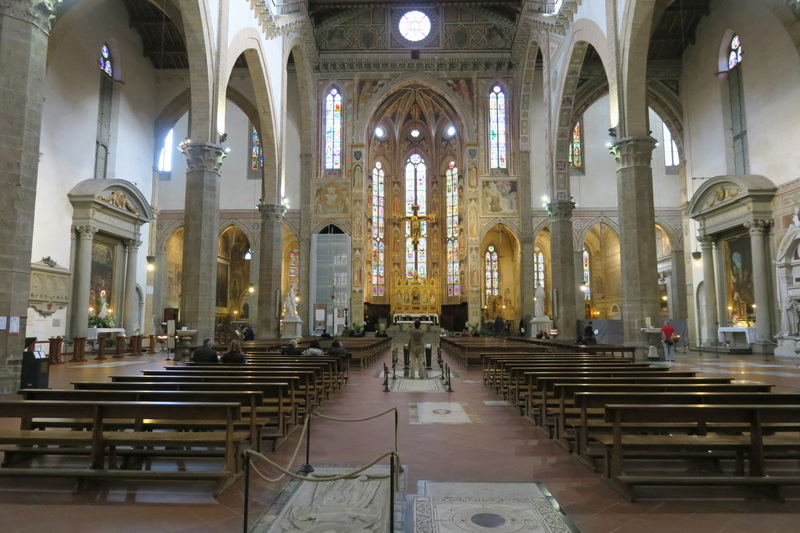 The second photo shows the interior of Santa Croce, while the Annunciation is by Donatello, ca. 1435. Saint Benedict: Seeker of God in Ordinary Things. Saint Benedict never struck me as the sort who aspired to have his own feast day in the liturgical calendar. Nor would he have taken well to the title “Patriarch of Western Monasticism.” On the contrary, all of this likely would have left him slightly embarrassed, because none of it squares with the simple life that he chose. For someone who sought the presence of God in the ordinary, such grand gestures would have seemed entirely superfluous. That said, there’s no denying the enduring influence of Saint Benedict. Born in Umbria in the late 400’s, he went to Rome for studies. There he found the social scene repugnant, and soon he fled to the mountains outside of Rome, where he began his search for God. From his experience as a hermit and then as an abbot, he drew the principles that undergird his appreciation of human behavior. From Eastern sources like Saints Basil and John Cassian and especially from his meditation on the Scriptures, he knit together a spirituality that puts him squarely in the Wisdom tradition of Christian writing. Benedict writes that the encounter with God ought not be rare, because one should see God regularly and easily. All you need to do is to open your eyes. First you will see God in the abbot, who is believed to hold the place of Christ in the community. The monk also sees Christ in the sick brethren and in the guest and in the poor. 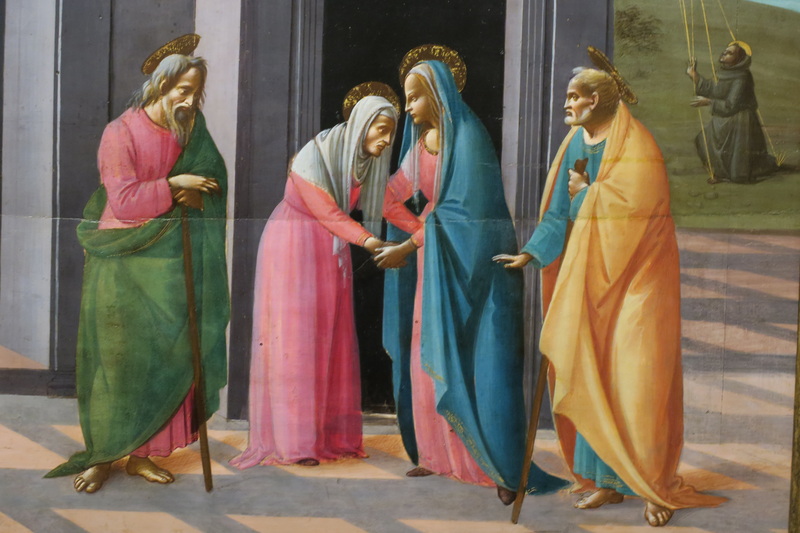 And in a departure from his sixth-century neighbors, Benedict writes that one can find wisdom (and God) even in the youngest of the brothers. I’m tempted to say that if Benedict were writing today, in our youth-centered culture, he would have to reverse the teaching. Only then would we understand the counter-cultural statements he often made. In the monastery Benedict proposes a balanced life which is neither harsh nor burdensome. Monks are to work and pray, but they are not to engage in the competitive ascetical practices that distinguished earlier generations of monks in Egypt and Palestine. His monks were to have enough to eat, sufficient sleep, decent clothing and all the other things that were necessary for life — in proportion to each monk’s need. In fact, Benedict discouraged any self-denial that might stir up pride. His asceticism was not a regimen of doing without, but rather doing pretty much the same as everyone else. While prayer and meditation predominate in his monastic schedule, Benedict’s emphasis on the importance of work was unusual for Roman society. For him all work was noble and all monks should work. Neither should they take pride in their talents, nor should they denigrate those who labor at menial jobs. Every task and every person has value in the monastery. When it comes to a balanced life, Benedict is equally pointed in his critique. Contemporary culture tends to value work above all else, and the highly-paid are the most respected of all. But in Benedict’s estimation all work is noble, and all who work for the good of others deserve our respect. Nor should we dismiss non-economic activity as worthless. Prayer has no monetary value, nor do music and recreation and time spent with family and friends. But in so many ways those are the activities that make life worth living. We shouldn’t need a saint to remind us of this. But on the other hand, someone who does recall us to these priorities has to be among the saints of God. Maybe that’s why we celebrate the feast of Saint Benedict. 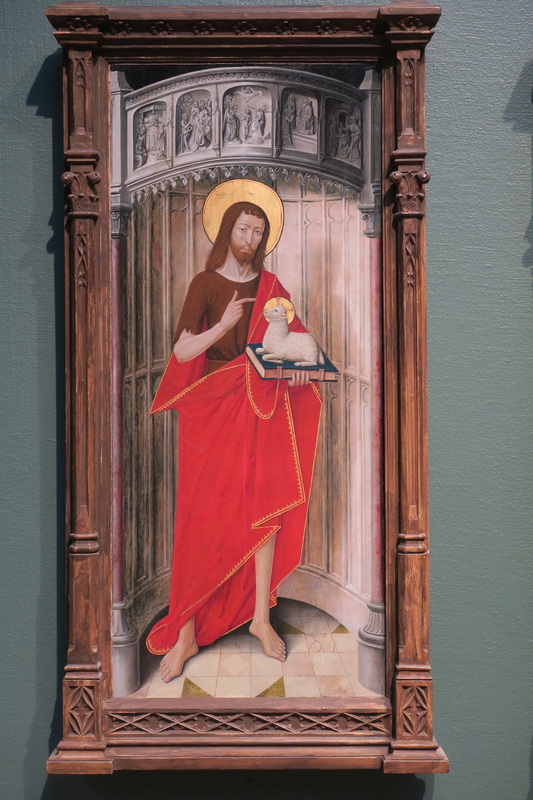 He certainly doesn’t need this feast day; but we do. +On July 11 we celebrated the feast of Saint Benedict. Today’s post first appeared in 2013 in The Abbey Banner, which Saint John’s Abbey publishes for its friends. To my knowledge I’ve never used this article in this blog before, so in the interests of conservation (my time and wits, primarily) I decided to recycle it as today’s post. It worked in 2013, and not all that much has changed in our appreciation of Saint Benedict since then. +On July 11th we witnessed the first profession of vows by Brother Jacob Berns, as well as the renewal of vows by several of our confreres. To cite the youngest and oldest of them, Brother Simon-Hoa celebrated his 25th anniversary, and Fr. Hilary marked the 70th anniversary since his first profession. Brother Jacob grew up in Perham, MN, and is an alumnus of Saint John’s University. After graduation he worked as a Benedictine Volunteer at the Abbey of Sant’ Anselmo in Rome, and then worked in music ministry in his parish. He plays the viola and organ (not simultaneously), and I look forward to hearing him at the organ console soon. Likely the highlight of the profession Mass was a communion hymn sung by Brothers Andrew, Thomas, Emmanuel, and Benedict — the four Cistercian monks from Vietnam who have been living and studying with us. 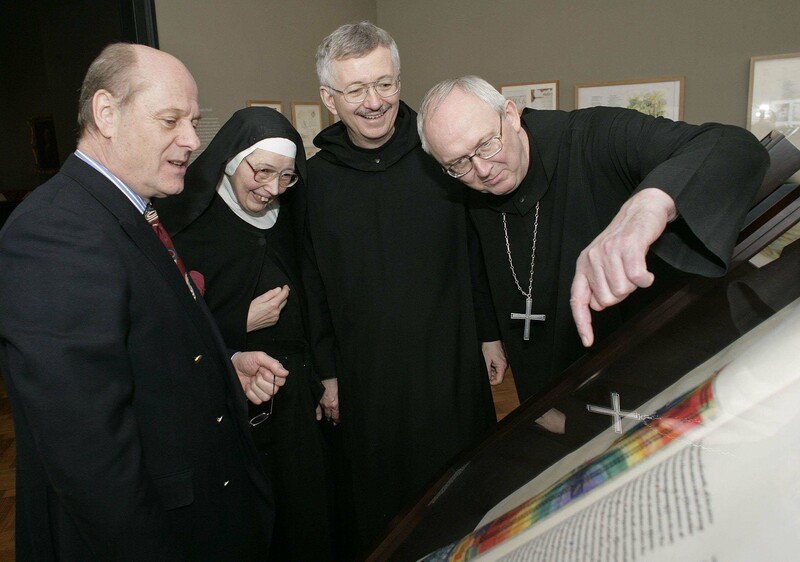 They were joined by a Florida priest-friend of Brother Simon-Hoa. With four of them singing in Vietnamese and Brother Benedict playing the flute, their voices literally stole the show. +On July 14-15 we hosted 75 oblates of the monastery, who returned to Saint John’s for the annual oblate retreat. +On July 15 we hosted at Mass and lunch some 30 Abbey volunteers who generously contribute their time and energy in a host of activities around the monastery. +Saint Benedict wrote that “guests are never wanting” in a monastery, and that has certainly been the case this summer. For several days we have been blessed with the presence of Bishop Felipe Estévez, from Florida. The bishop of Saint Augustine, he prayed with us and joined us for meals in the monastic refectory. We thoroughly enjoyed his company. Currently we are hosting Frs. 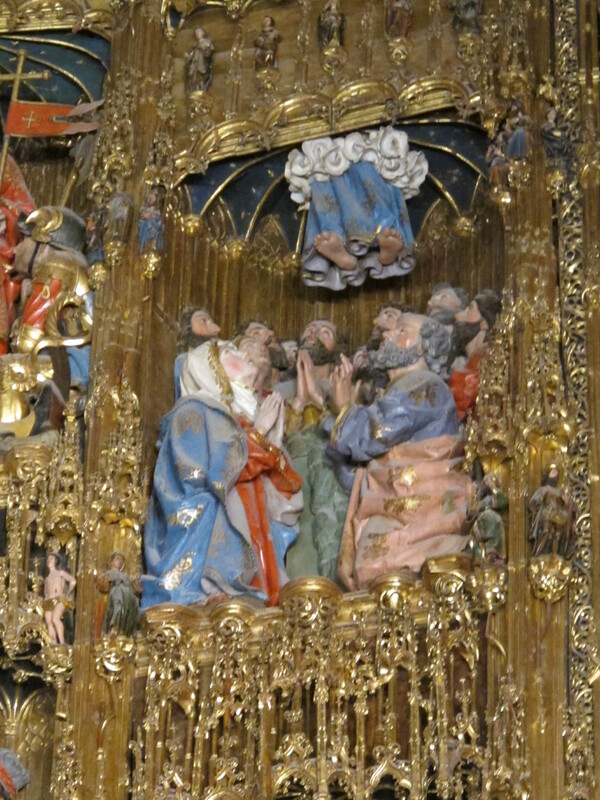 Efrem de Montellá and Bernat Juliol from the Abbey of Montserrat, located just outside of Barcelona. They direct the Escolonia, the choir school at Montserrat; and they have been here to talk about the Benedictine Volunteer Corps. For several years we have had graduates of Saint John’s working there as volunteers, and they continue a relationship between our two abbeys that stretches back nearly a century. 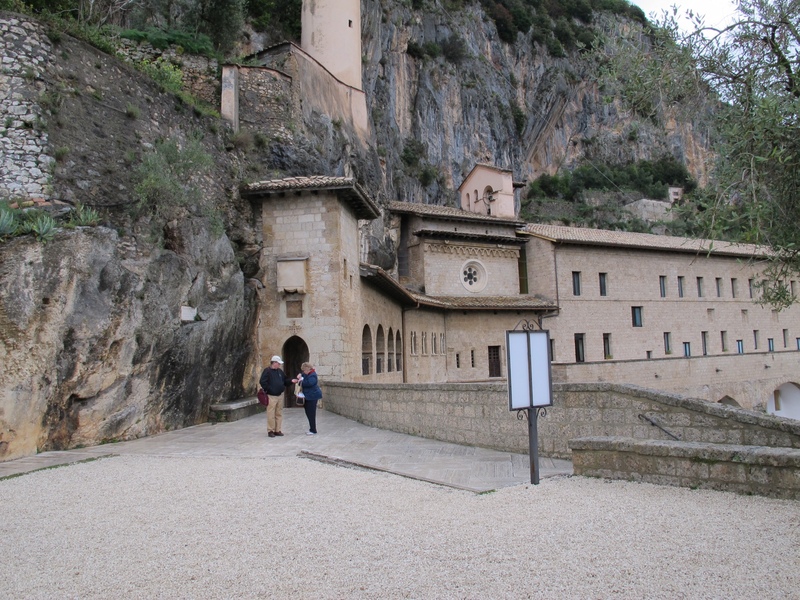 +The top three photos in today’s post show the site of Benedict’s first monastery, at Subiaco, outside of Rome. At Saint John’s images of Saint Benedict abound. 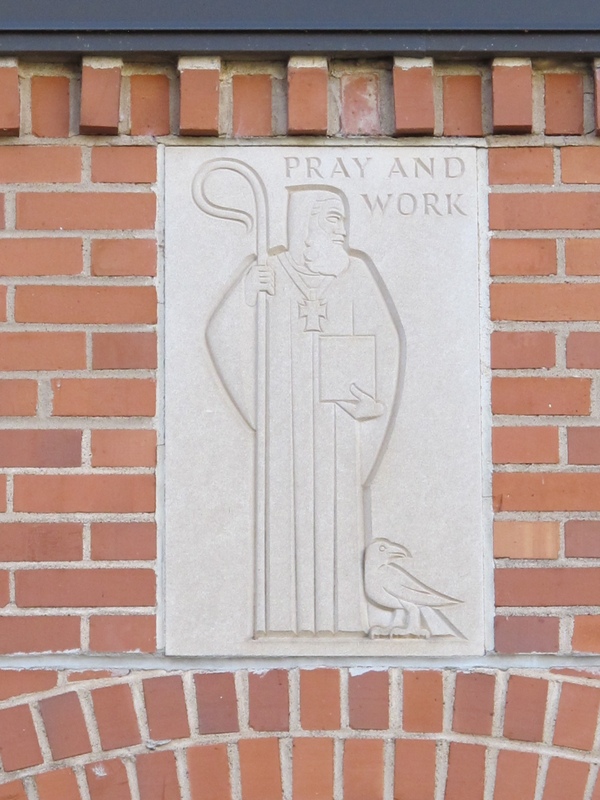 The stone etching of Benedict’s motto — “Work and Pray” — is embedded in the exterior brick of the Quadrangle, while the granite carving of Saint Benedict is mounted on the wall inside of the east cloister walk of the monastery. 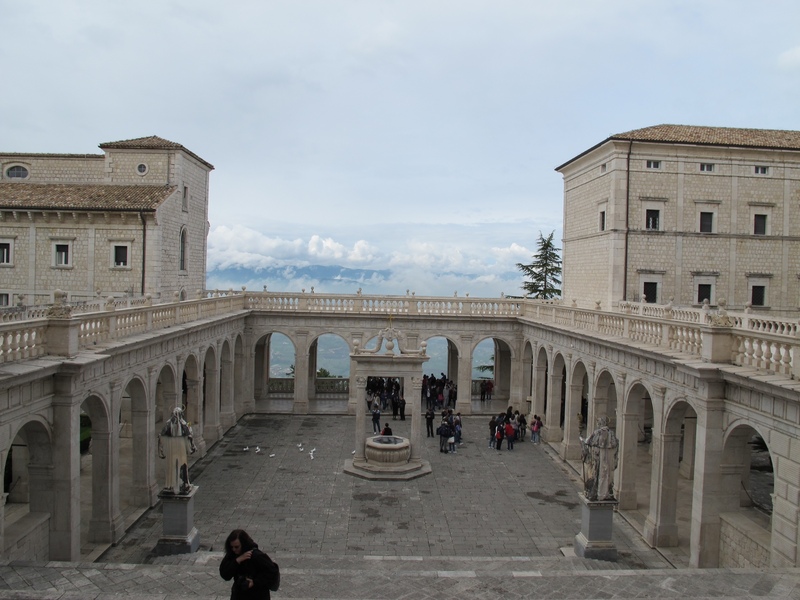 Benedict’s preference for remote locations is confirmed by the view from Monte Cassino, at bottom. 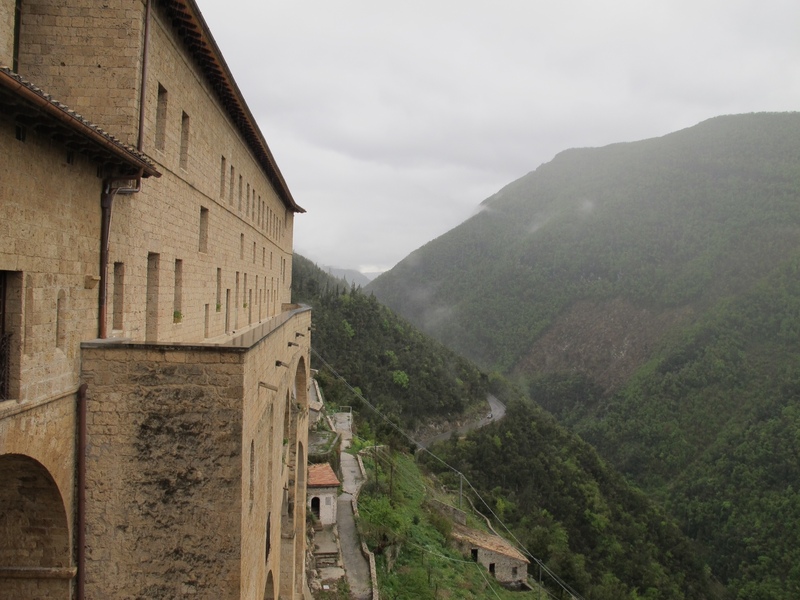 The monastery is renaissance in design, but the view of the clouds and countryside is as Benedict left it. The story of the Tower of Babel is one of the great parables of the Old Testament. In brief, it describes a group of people who assumed they had no limits, and they expressed this in a tower that would reach endlessly upward. But of course they failed; and as the tale concludes, God frustrated their designs through the introduction of languages that disrupted their common purpose. I call it a parable because that’s really what it is. On the one hand it certainly does try to explain the variety of languages that impedes seamless communication among people. On the other hand, it’s a parable that explains why humans as a group have such a hard time staying on topic and on mission. One day we all agree on a common goal, but the next day rugged individualism and tribalism interfere with the best of common pursuits. Beyond that, the Tower of Babel is a parable of hubris. Somehow people had come to the conclusion that they had created themselves. In a flight of fancy they believed that they were like God or perhaps no longer needed God. They imagined themselves to be almighty; and the Tower of Babel was only one of several instances in which God disabused them of that notion. That’s a key bit of context for Pentecost. Gathered in an upper room and afraid of the world on the other side of the door, the disciples were paralyzed with fear. They locked the door, I suppose in hopes that the world might go away. Then came the Spirit, and with the Spirit came the power to break free of the consequences of Babel. Variety of languages no longer constrained them. They spoke of the Lord in all languages, and in their new-found freedom the sky was the limit. In retrospect it’s easy to appreciate how all of this energized the apostles. On the one hand, they were the same people as before. They still had their limits, and they knew them. But the Spirit breathed new life into them, and the apostles then earned the right to take as their own the words of Mary. 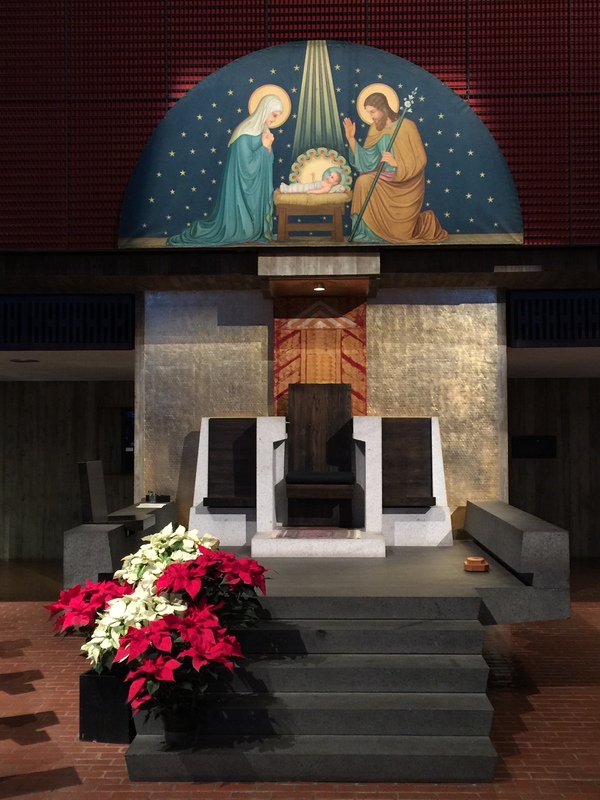 The Lord began to do great things through them, just as he had done with Mary. I suspect most of us don’t think about how the Spirit can work through us. Most days I assume that the Spirit works primarily through other people. Leadership is the responsibility of others. Action is the responsibility of people of talent and energy. And the works of the Spirit are for people far better positioned than I. But of course on all counts I’m wrong. All of these items are in my job description too. As God did with Mary and the apostles, the Lord does with me: the Lord can and will do great things. For centuries preachers have spoken of Pentecost as the birthday of the Church, and that’s certainly true. It’s the day on which the Spirit came to rest on the apostles and told them to stop sitting around and get on with life. Jesus had come to give life, and to give it in abundance. It was the job of the apostles to carry on with that work. But the gifts of the Spirit did not end on that one day. I give the apostles credit for realizing that the job was far bigger than they, and they immediately went off and shared responsibility. They breathed on others the life of the Holy Spirit when they baptised. They conferred the Holy Spirit when they imposed hands on others in confirmation. They were the first to recognize that the Spirit was not meant for them alone. The Spirit is meant for all, and the Spirit is a gift that speaks across any and all human boundaries — and not just the linguistic ones. For the disciples Pentecost was the beginning of a strange and wonderful pilgrimage, and that same Spirit animates us as well. That same Spirit urges us to step out from the sidelines and engage in life to the fullest. The Spirit invites us to let the Lord accomplish some pretty significant things in us — things that could very well surprise us. So it is that it’s nice to celebrate Pentecost once a year. Still, the point of Pentecost is this: it’s an everyday sort of feast. It’s a reminder of how the Spirit empowers us to reach out and accomplish the impossible, even if it has to be on a weekday. +This past week we hosted in the Abbey the twenty-two individuals who will comprise this fall’s Benedictine Volunteer Corps. All graduated from Saint John’s University on May 13th, and so this marked their first week out of school since kindergarten. It was a real delight to have them with us during their weeklong retreat in preparation for service next year in Benedictine monasteries around the world. +I just finished reading a book which a good friend gave me for Christmas. Now that I’ve finished it, I realize it did not really reflect anything of the Christmas spirit, but it was entertaining, to say the least. Jeffrey Lee’s God’s Wolf tells the story of Reynald de Chatillon, who turned out to be one of the most unscrupulous of the 12th-century crusaders in the Holy Land. To his credit, Reynald did succeed in bringing Christians and Muslims together in a common appreciation for him. It seems that people on all sides came to mistrust him. And it likewise seems that he was noted for his indiscriminate violence, if both Christian and Muslim sources are to be trusted. The book reads almost like a novel, and it illustrates how complex politics in the Middle East can be, even in the 12th century. 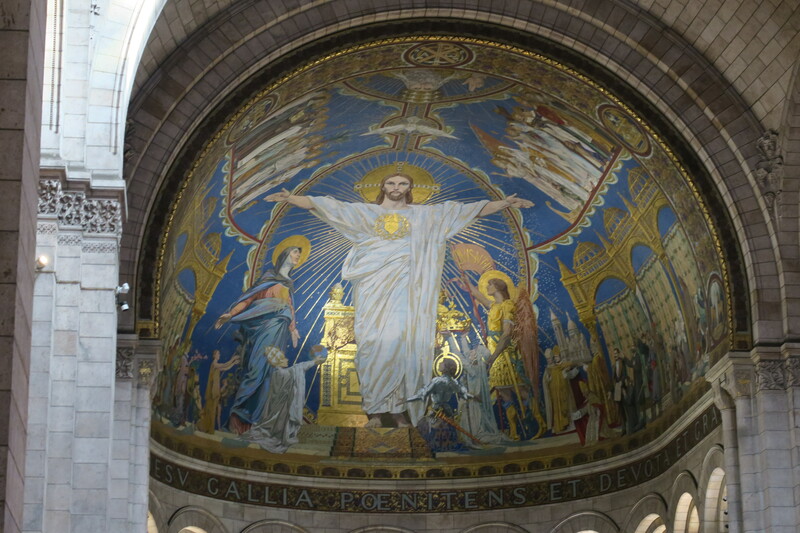 +In last week’s post I showed illustrations from the Abbey of Saint Pierre on top of Montmartre in Paris. 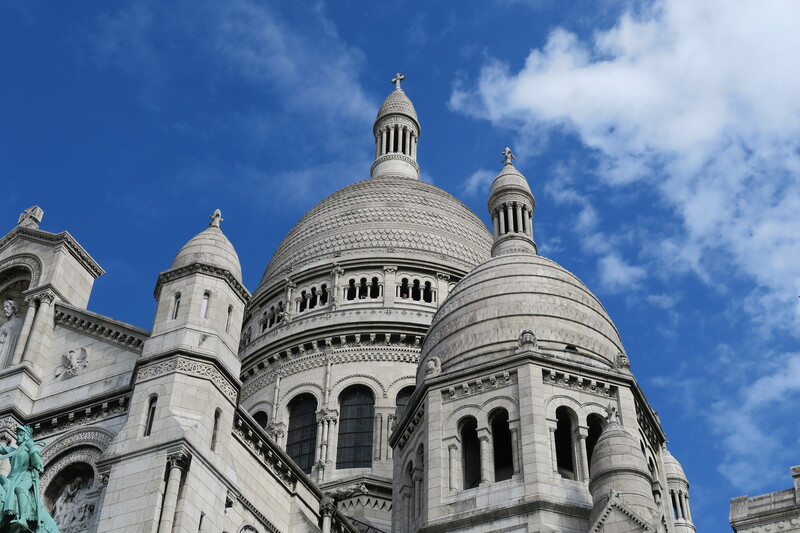 I noted that most of the people who trek up the hill rarely visit the abbey, but they flock in droves to Sacre Coeur, its more famous neighbor. 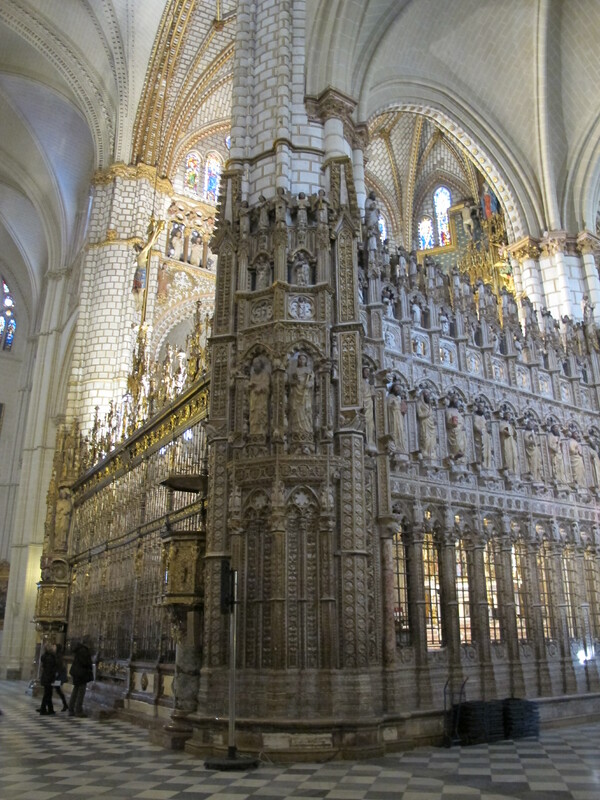 It truly is an impressive edifice, as these photos suggest. For those of you who assume that life in a monastery is routine and unchanging, I have news for you. Yes, there is the regular schedule that varies little from day to day and week to week. Yes, there are assigned tasks that include readers and servers and celebrants for Mass, and readers and servers for table, as well as sign-up sheets for other tasks and responsibilities. Saint Benedict alluded to the need for this in his Rule, and these lists eventually get coordinated and posted on the bulletin board for all to see. However, far from outlining some unchanging reality for the coming week, these lists merely suggest what ought to happen if this were the ideal world. Like most every other place on earth, however, the monastery is not the ideal world, and that’s where email has become a great gift when the need to adjust comes up. Once upon a time, if I were assigned to be table reader and couldn’t make it, for whatever reason, this meant going from monk to monk to find a substitute. Much like the mariner in The Rhyme of the Ancient Mariner, I would have to explain my situation and humbly ask for help. My hope, of course, was that I would eventually find some generous soul who could and would be willing to take my place. And naturally this sometimes involved horse-trading of a sort, with me offering to take on some job assigned to the other monk. Generally, however, we all have to rely on the good will of our brothers and hope for the best. The internet has changed the entire dynamic, thankfully. The advent of a Listserve which can reach every monk has introduced to the monastery our equivalent of electronic trading. Pretty much every day there’s one or two appeals from monks who desperately need a substitute for something because their schedule has changed or because they’ve accidentally double-booked themselves. Usually we get an answer within minutes, which strikes me as the greatest benefit of our unique form of electronic trading. I cite all this as a preamble to a trade I made last week, and quite by accident I was the one who came out way ahead on the deal. I had been scheduled to be the celebrant for Mass on Friday, and my confrere Fr. Nick was up for Mass on Thursday. Nick had sent me an email, hoping against hope that I would be willing to trade days with him. To his consternation he had two appointments for that date, both at the same time. But since there was only one of him, this made for a difficult situation. 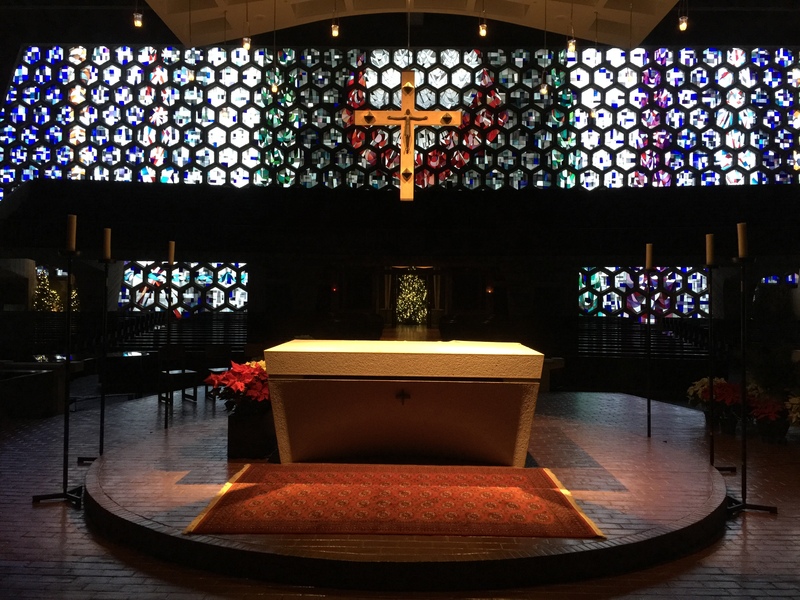 Much to his relief I was able to make the trade, and that’s how I gave to him Friday of the sixth week of Easter, while I came home with the memorial of St. Bede. I was the clear winner in that deal, at least from my vantage. St. Bede may matter little to most people, but I’ve always treasured this 8th-century Benedictine monk from the north of England. In the 8th century most Europeans considered the north of England to be pretty much the edge of nowhere; but despite both the location and the relatively recent advent of Christianity, Bede had become one of the greatest scholars of the day. And he has had an impact that reverberates even to this day. Bede was a prolific writer, but he is best known for his History of the English Church and People, which I read for the first of many times in college. It remains a fascinating text, all the more so because he pushed the envelop when it came to two ideas. For one, in his day there was not yet an English church, and many of his Celtic neighbors would have taken umbridge at the thought that Bede had lumped them into it. There also was no such thing as an English people just yet. That reality was yet to come. In Bede’s day there were Saxon and Angle and Jute and other Germanic tribes resident in what would become England; but it would be a big stretch to call them a united English people. That would come later, and English would emerge as a language only after many centuries. Bede, however, was a visionary, and the fact that his vision became reality impacts us culturally and religiously to this day. What brought all these tribes together was the preaching of the gospel in what became England. In Bede’s thought the advent of Christianity made and shaped the English as a people, and Bede grafted this people onto the history of the Mediterranean homeland of Christianity. Ironically, then, most of us Anglophones today can easily name one or more Roman emperors, but ask us to name the tribal kings of the East Anglia in the 5th century and we draw a blank. 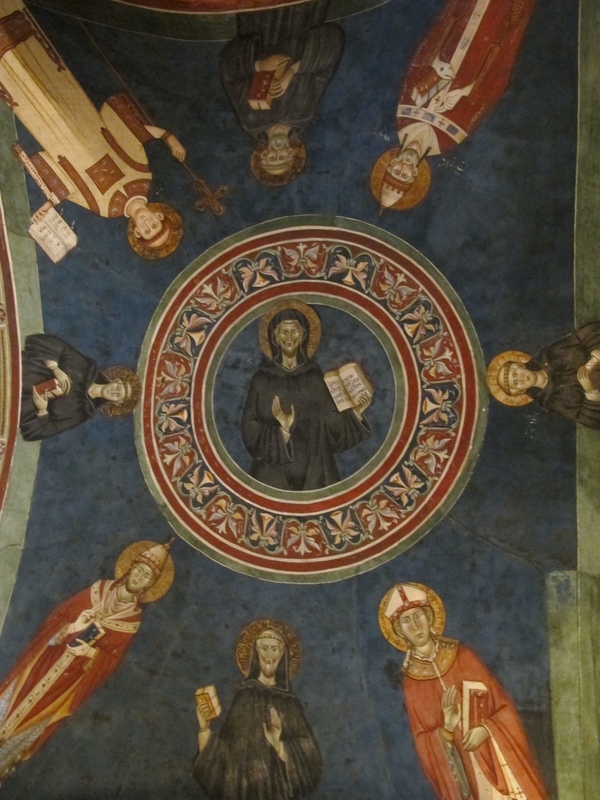 Call it cultural imperialism or whatever you wish, but that’s the way it is, and Bede and his succession of readers are responsible for that worldview. 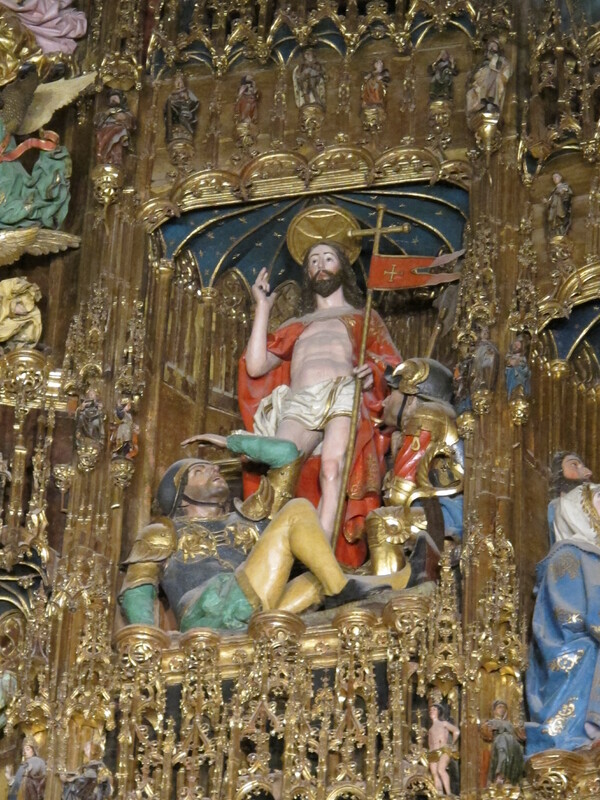 At his Ascension Jesus gave his final instruction to his disciples. Included in that was the great commission to preach the gospel to the ends of the earth, which some of his followers took seriously enough to actually do. Six centuries later that message reached the ears of a young man named Bede, who became a monk in a remote corner of England, far from Rome and even further from Jerusalem. 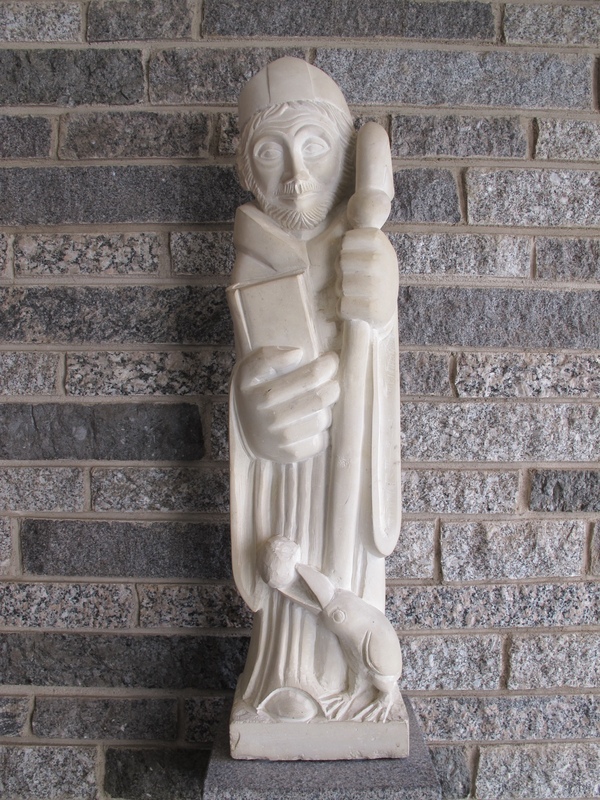 Bede grew up to be an extraordinary scholar, but he also became an example of what the gospel can do to energize the lives of any and all of us. Today we may not have the opportunity to preach the gospel to the ends of the earth, but we do have the chance to bring the face of Christ to the limits of our own little worlds. And the lesson is clear for us all. There are no geographic limits to where Christ can reach. There is no aspect of our own lives which Christ cannot transform. And there is no limit to what Christ can accomplish through us if we but welcome him. After all these centuries, Bede still reminds us of that — and more. 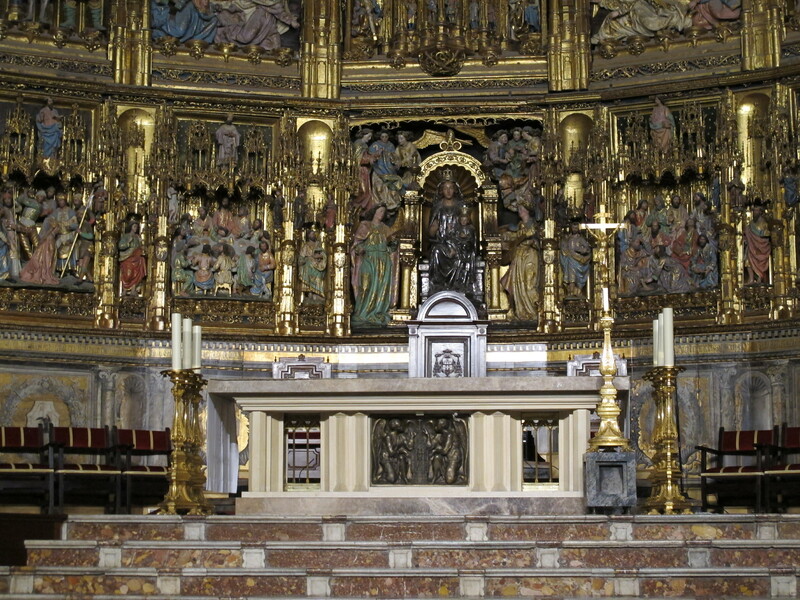 +On May 25th I presided at the Abbey Mass, which happened to be the memorial of St. Bede. +On May 25th I also gave a conference to the members of the Benedictine Volunteer Corps, who on the 27th completed their two-week retreat and orientation. 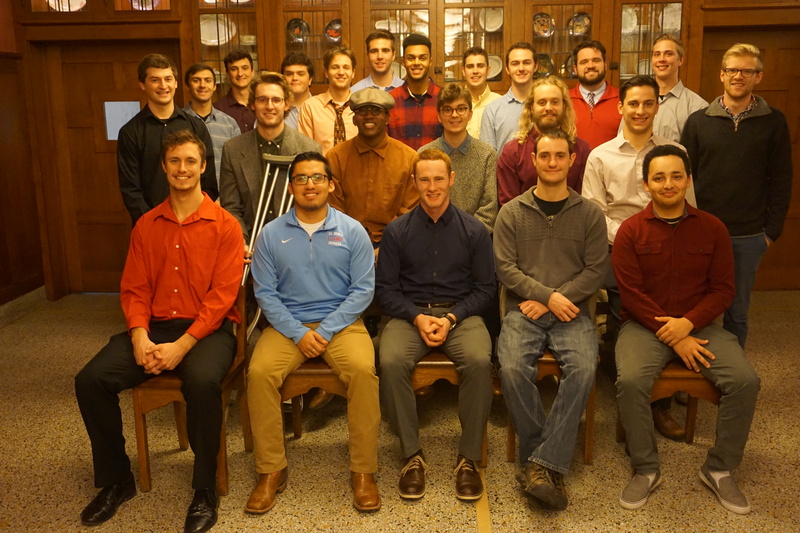 In the course of the summer these nineteen graduates of Saint John’s will disperse to the four winds as they take up assignments at Benedictine communities around the world. +Saturday May 27th was a busy day at Saint John’s. It began with graduation for the seniors of Saint John’s Preparatory School. Bishop Donald Kettler of St. Cloud presided and preached at the graduation Mass that preceded the commencement exercises. That day there were two burial services in the cemetery, and we rounded out the day by hosting 250 alumni of Saint John’s University, who had returned for a two-day rugby reunion. Thankfully none of these four events ran into each other. 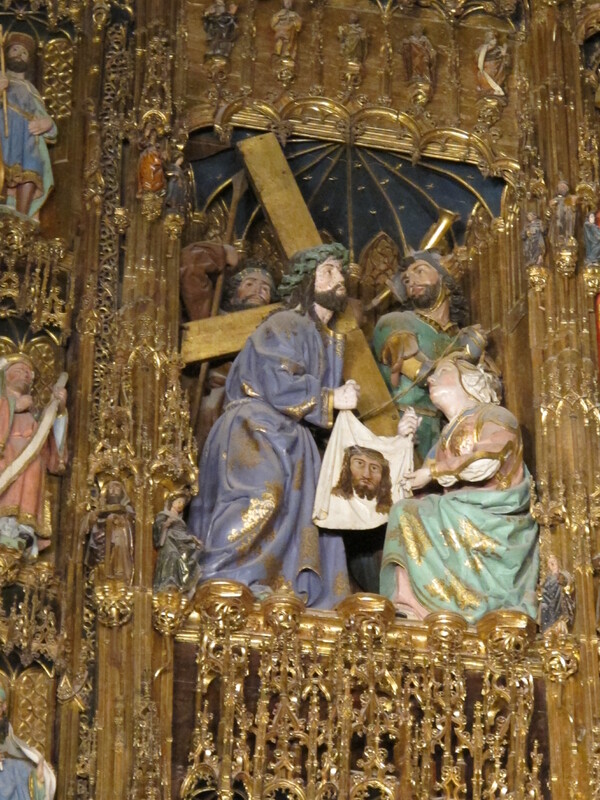 +The photos in today’s post all come from the cathedral of Toledo (in Spain, not Ohio). 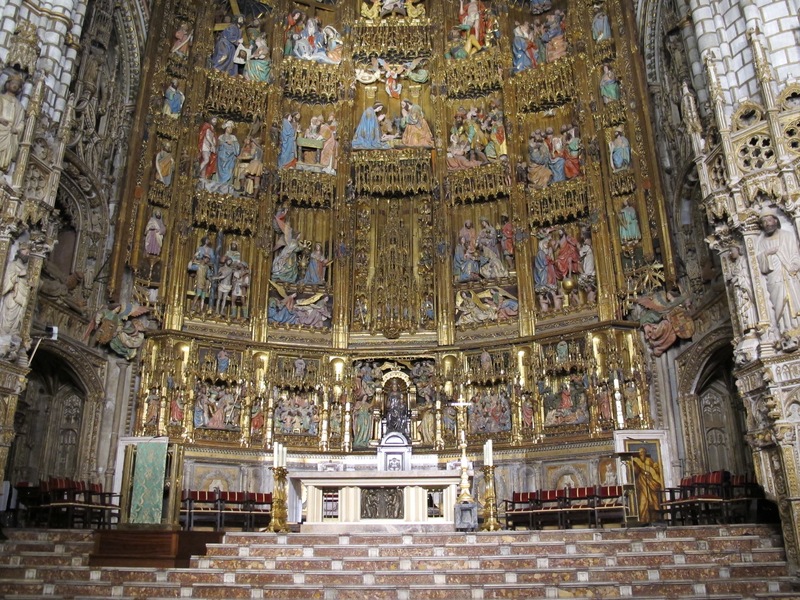 They show the late medieval reredos behind the altar, and they depict scenes in the life of Christ. 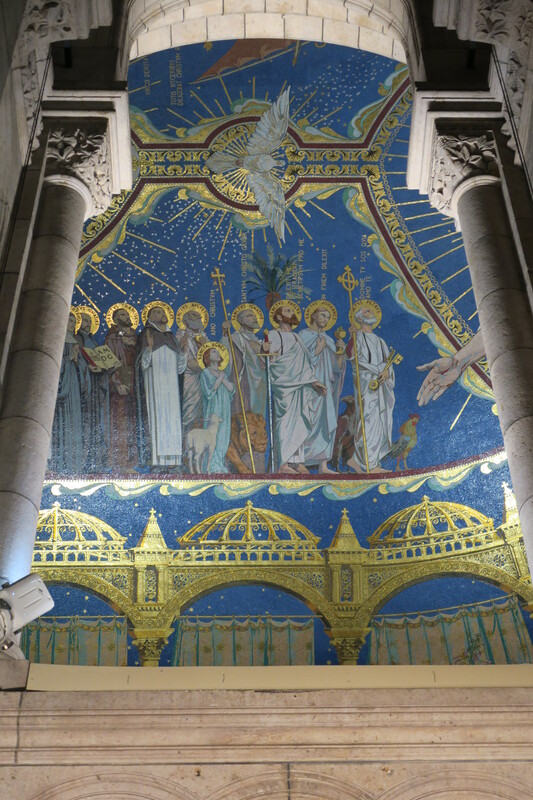 I especially like the image of the Ascension, in which Mary and the disciples look up as Jesus goes to heaven. Note the bare feet, which indicates to me that there is no need for shoes in heaven. Memorial Day marks something of a new beginning for people. For a few who are tradition-bound it’s time to put on seersucker and whites with nothing to fear from the fashion police. For others it’s time to rehabilitate the local version of Minnesota’s cabin up north. And for most everyone with residual memories of school days, Memorial Day rekindles the primal thrill of liberation from the classroom. The onset of summer does seem to offer something for everybody, and at the very least it hints that the hectic pace of life is about to tone down a notch or two. That’s the promise of the opening line of George Gerschwin’s song in Porgy and Bess, which asserts that it’s “summer time, and the livin’ is easy.” For a few that tranquility actually materializes, and life really is wonderful. But for many, including Porgy and Bess, the summer will bring mixed blessings. Moments of leisure will punctuate the days and weeks of summer, but if anything the relentless toil and challenge of life will go on. The “easy livin'” will be just beyond their reach, as it always has been. 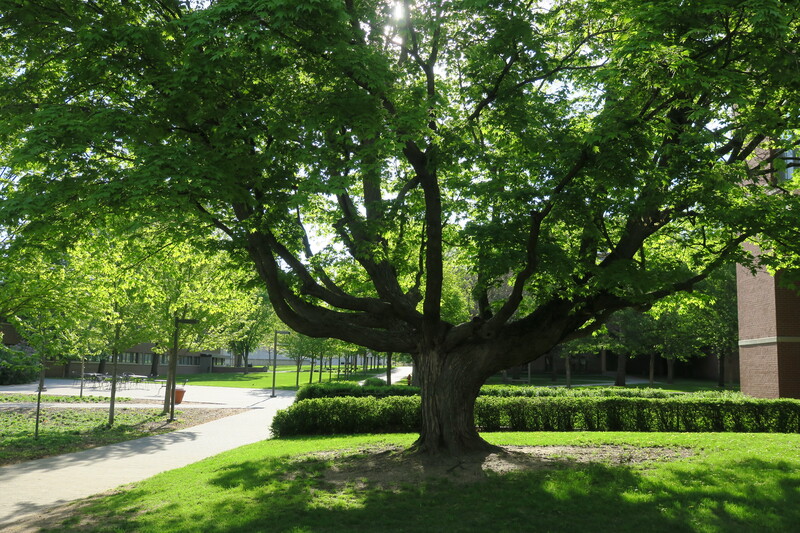 In his book Strangers to the City, the Cistercian monk Father Michael Casey writes about the need to slow down and open ourselves to the wonders around us. Of course the leisure for that might seem to be a luxury that we can ill-afford, but for the monk it is a sine qua non in the search for wisdom. To his credit Casey points out that this search for wisdom ought not be the sole purview of monks, because all of us need to get a grip on ourselves and stop and smell the roses. I’m not about to disparage work or productivity, but all too often we distill the essence of our lives down to our work. We are what we do, and introductions these days go directly from the name of the person to the issue of occupation. And if truth be told, we’ve probably always done it that way, as the story of Moses’ first encounter with God suggests. Moses asked God for a name, and to God’s credit God gave Moses a succinct answer: “I am who I am.” There was none of this “I do this for a living.” Nope, God is being, not doing, and that is a nugget of wisdom that we can all live with. Our personal value derives from the fact that we are the image of the divine. Our daily work flows out of that belief, but work is not who we are. One of my favorite cartoons appeared several years ago in The New Yorker Magazine. It shows a well-dressed couple about to go out to celebrate their wedding anniversary, and the husband presents to his wife a handsome leather-bound volume as a token of gratitude for another year together. “Oh Stephen, how thoughtful — an annual report on our marriage!” Obviously it’s not what she had always wanted. Summer starts in a few days, and it offers us lots of possibilities. If we tackle it in the same way that we do the other seasons, then we may very well compile an impressive list of what we accomplished during our summer vacation. If we yield to moments of leisure, however, and use the eyes and ears that the good Lord has given to each of us, then we may end the summer with a few nuggets of wisdom that we picked up along the way. This approach seems to me to be worth the risk. On the one hand, come Labor Day the chapter on summer in our annual report might be a bit thin, but life itself might very well be full. Some would dare to say that’s exactly what God has in mind for us this summer. Who am I to argue with that? +On May 20th I gave a conference at the day of reflection for members of the Order of Malta in the Subpriory of Our Lady of Philermo. The gathering took place in Menlo Park, CA. 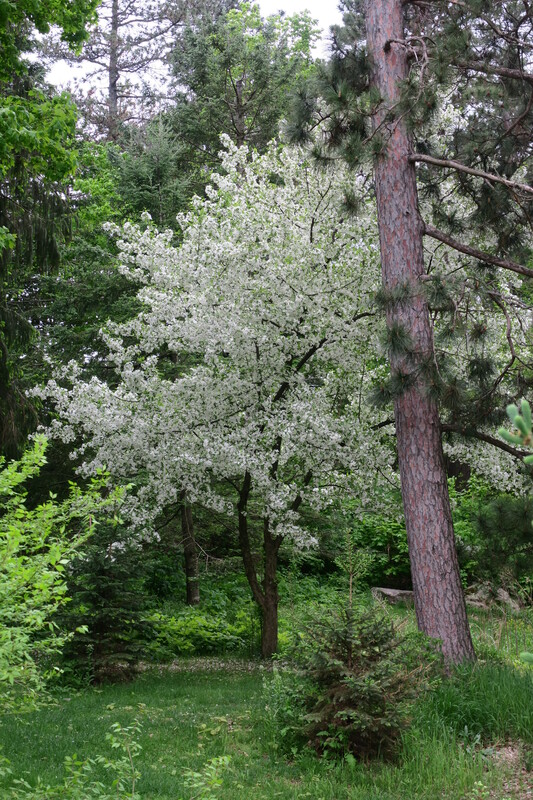 In our cycle of activity we do a three-day retreat in the fall and a one-day gathering in the spring. +Last week nineteen spring graduates of Saint John’s University began a two-week orientation and retreat in anticipation of their year as Benedictine Volunteers. Later this summer they will head out to Benedictine houses literally around the world, where they will be for a year of service. +On May 20th Bishop Donald Kettler of Saint Cloud came to the Abbey and ordained to the priesthood our confrere Father Efrain Rosado. On Sunday Father Efrain presided at the Abbey Mass. +Last week we had tons of rain, and it has spurred on the growth around us. 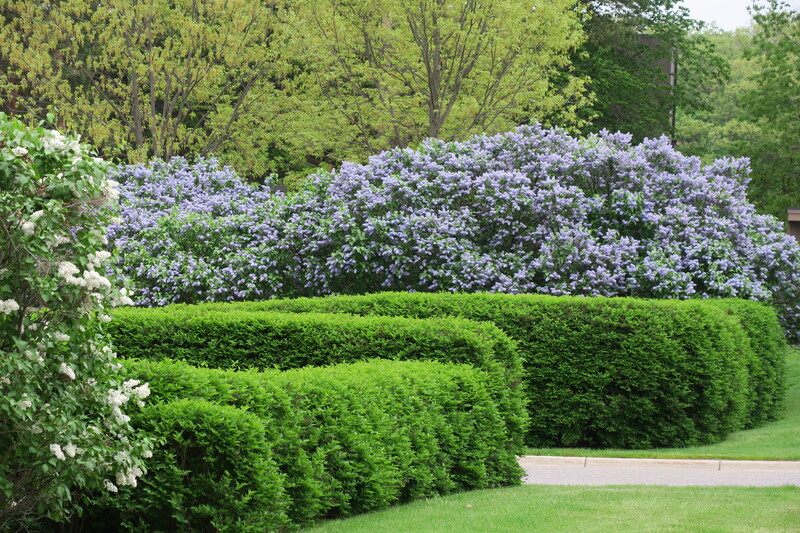 In particular, the scent of lilac has pervaded the campus, and it’s been just wonderful — provided you like the scent of lilac. 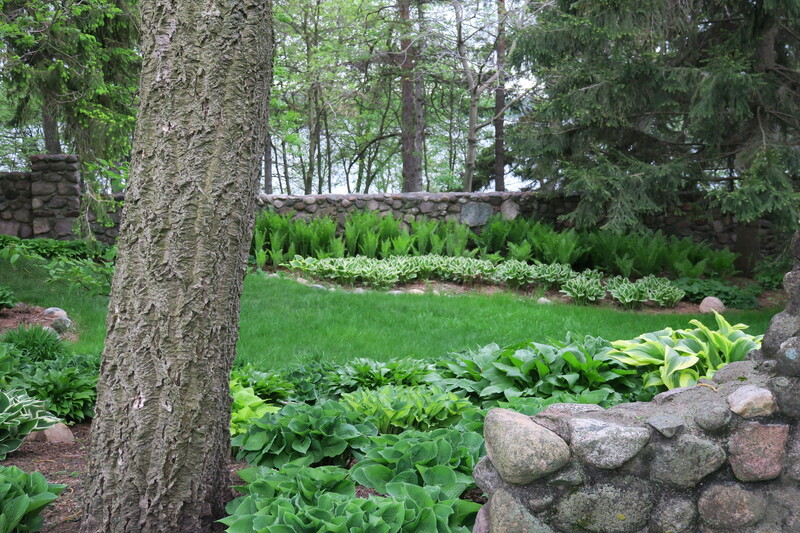 We have lots of it planted all over the place.